The WEN 3920 is a variable speed scroll saw that helps make intricate and artful cuts in work pieces, helping you have complete control over your creativity and designs. The table is quite spacious and slants 45 degrees maximum. The WEN 3920 can manage any kinds of woods, regardless of their composition and thickness. The saw can also be used with pinless and pinned blades. This means there’s a lot going in favor of this scroll saw. Let us take a look at the saw in much more detail in this WEN 3920 16-inch variable speed scroll saw review. The saw comes ready-to-use right out of the box. It’s completely assembled, the set of controls are easy, and instructions are clear. This is something first-timers would find quite convenient. The table is big enough for different woodworking requirements, regardless of how complex of a task you’re at. There’s just one blade in the box. Usually, scroll saws in this category have at least two blades. The blade-changing process can be a task, especially when you compare how easy it is to change blades on other similarly-priced saws. The LED light bouncing issue can be a concern. However, if you have an overhead work light (which you should), then you need not rely on the LED light. Where to buy additional blades? If you’re looking for more blades, you can easily buy them at local hardware stores and also online. Is this scroll saw too loud? The saw does make some noise, but the actual levels depend on the wood’s thickness. The noise is usually courtesy the minor bouncing the saw does during operation, and these bounces happen to be more when working on wood that are ¾ inches thick or more. Is the iron just in the base of the item? Not just the item base, even the table is made of iron. Are spiral blades okay to use? Yes, spiral blades can be used with this saw and they work exceedingly well. In fact, many woodworkers use spiral blades as primary blades on this saw. Is a foot switch added? There’s no foot switch added in the box, but you can buy it separately. 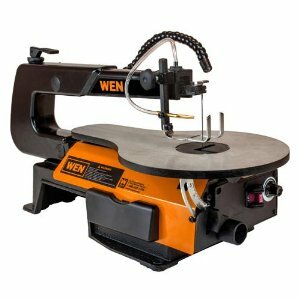 For the price, the WEN 3920 is the best scroll saw out there. It’s also the most user-friendly. The saw can be easily set up and used; it has variable speed options; and can take both pin-less and pin blades. This versatility and usability is what most beginner woodworkers look for and the WEN 3920 delivers both on paper and on the floor. If you’re cutting wood as a hobby and not as a serious profession, the WEN 3920 should be more than ideal.